Yesterday saw APPG for British Sikhs Chair and the UK's first female Sikh MP, Preet Kaur Gill, unveil a statue of a Sikh soldier by local sculptor, Luke Perry, to commemorate the sacrifice made by Sikhs in the First World War. The unveiling of the 'Lions of the Great War' memorial, commissioned by the Guru Nanak Gurdwara in Smethwick and paid for by the local Sikh community, was marked with a parade and speeches by local dignitaries. "Sikhs have had a long-established community over the generations, both in Great Britain and abroad. Yet despite being small in number in British India, Sikhs played an important part in the war, making up more than a fifth of the British Indian Army and suffering huge losses as a result of their involvement. To put it in context, 83,000 Sikh soldiers were killed and around 107,000 were injured in the two World Wars – which is around the same number of regular soldiers that the British Army has in its ranks today. It is an often-overlooked fact that one in every six British soldiers was from the Indian subcontinent, making the British Indian Army larger than all the commonwealth forces that they fought alongside, combined. 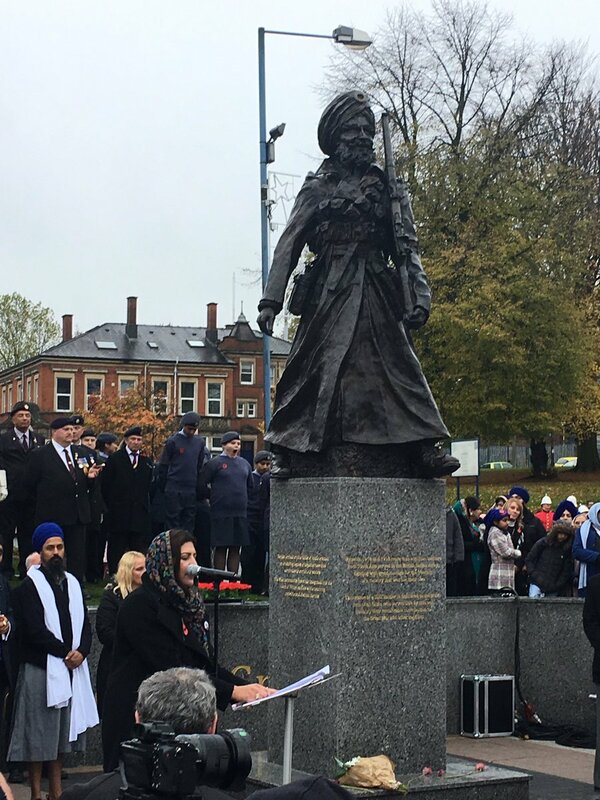 And with the Commonwealth Games coming to Birmingham in 2022, this statue will serve as a timely reminder to our commonwealth guests of the camaraderie and sacrifice shown by Sikhs throughout the wars, and who sacrificed their lives in defence of democracy and in the fight for freedom."